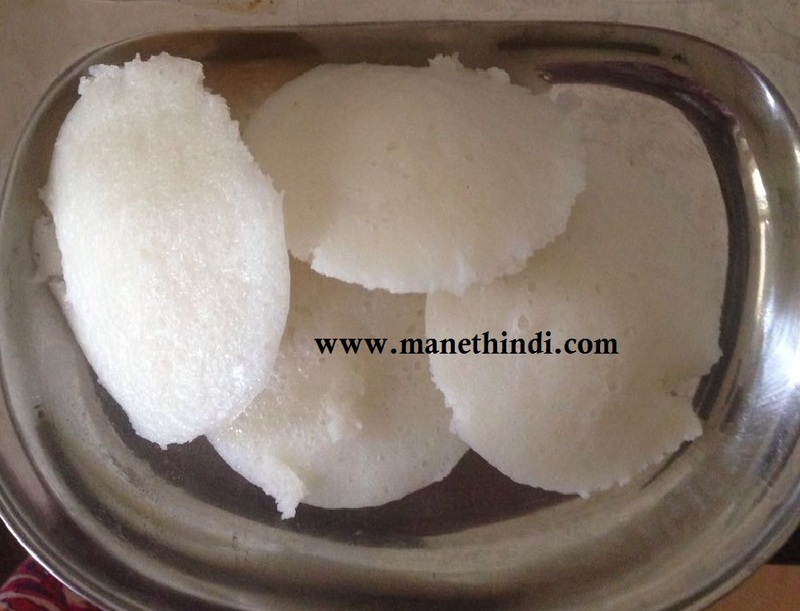 Mallige [Rice] Idly -Rice Idly is a staple across India. Though a breakfast dish, it can be eaten anytime of the day. Mallige in Kannada Language means "Jasmine". This term has been given to the humble idly as it turns out very soft and looks very white just like the flower. It originated from Mysore - a royal city in Karnataka known for its pioneering recipes and Mallige Idly is one of the very popular ones. Its light and easy to digest and tastes great with sambar or various chutneys like the tomato/coriander/pudina/coconut chutneys. Generally Mallige idly is made from Suji or Semolina but i have used rice and its got a unique aroma to it. Freshly Cooked rice - 3/4th cup [appx. 150gms] - Key ingredient! This is the item which makes all the difference in this recipe! Soak Urad dal and Rice for about 4-5 hrs with sufficient water. [Handy Tip: If you need to make it quicker one could soak the grains in hot boiling water and cover with a lid. It will take half the time to soak]. To this mixture add cooked rice and grind together. Add little salt to the risen batter and mix well and set aside. Grease the idly plates with cooking oil or ghee and pour the batter on the plates. Stack up the plates and place them in an idly pot or a pressure cooker without the whistle. Steam in high flame for 5-7 mins and then reduce the flame and steam for about 2-4 mins and turn off the heat. Let the idlies stay in the hot vessel for a couple of mins before taking it out. Serve hot n fluffy idlies with accompaniments of your choice.